Krishna drops Radha to her home and says today’s day was so beautiful. Radha says it would have been more beautiful if he had not left with his friends, anyways it was indeed beautiful. Krishna says he will leave now as he has to help his father make Basanth Panchami’s arrangements. Radha takes his bansuri/flute and says she will call him via it and reminds his promise to meet her whenever she calls. Krishna nods yes. Ayan tells Jatila that she spoke a lot in front of king Kans, how will he become Krishna’s best friend while Krishna has so many friends. Jatila says she is just worried about Balram who does not leave Krishna alone at all, so he has to create drift between Krishna and Balram, it is not an easy task and she likes difficult tasks. Krishna walks to Balram and sees him trying to count money, asks from when he started caring about money. Balram says it is all because of Krishna, father/Baba has asked to sell butter in market and gave some money, but he does not know how to count money. Krishna says he will help him and accompany him to market. Balram says that is a good idea. Next day, Balram fills cart with butter pots. Radha brings big pickle pot and says maa gave it. Balram taunts it is very heavy, if it has stones. Yashoda says her Balram is going to sell butter in market for the first time. Nand asks Balram to be careful and take Krishna’s help. Krishna and Balram get ready to leave when Radha plays flute to call Krishna. Krishna tells Balram that he has to go. Balram says he told to accompany him to market. Krishna says he just told him, but promised Radha to meet her whenever she calls him. Radha walks to them. Krishna says he cannot accompany her as he has to accompany Dau to market. Radha asks what if she also accompanies them and asks them to go while she comes with her friends later. Balram and Krishna reach market and wait for Radha after setting up shop. Radha reaches with her friends and asks Krishna to accompany her. Krishna says he needs to help Balram sell butter. Balram says he wil manage, 1 butter pot equals to 5 coins. Krishna says yes and walks with Radha. 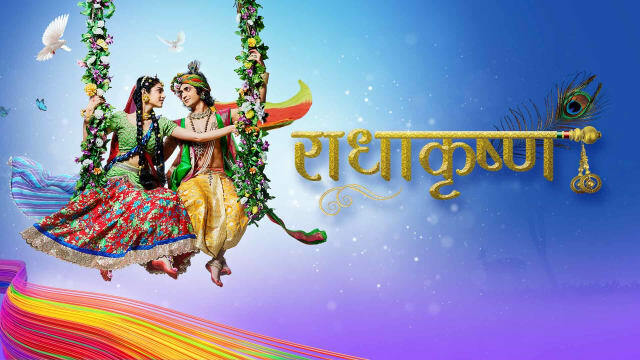 Radha does not let Krishna go back to Balram. Balram finds difficulty counting, but buyers themselves help him. Radha forces Krishna to spend whole day with him and in the evening Krishna sees Radha’s friends have already gone. Radha shows her shopped items to Balram and says Krishna helped her in shopping. Krishna thinks Radha is getting possessive now. Krishnna gives moral gyaan that lock can be opened by force with hammer or peacefully with key; if they use hammer, lock is unusable next, but if they use key, lock will be reusable. Relationships in our lives are similar and give them happiness with love, but if they use force of anger, relationships break. Precap: Krishna tells Balram that Radha is getting possessive, he has to do something. Radha draws her and Krishna’s pic and says whenever she closes eyes, she sees this and when she opens eyes, she sees Krishna. Krishna says she loves him, but her deeds are forcing her towards obsession. Radha asks if he really loves her.